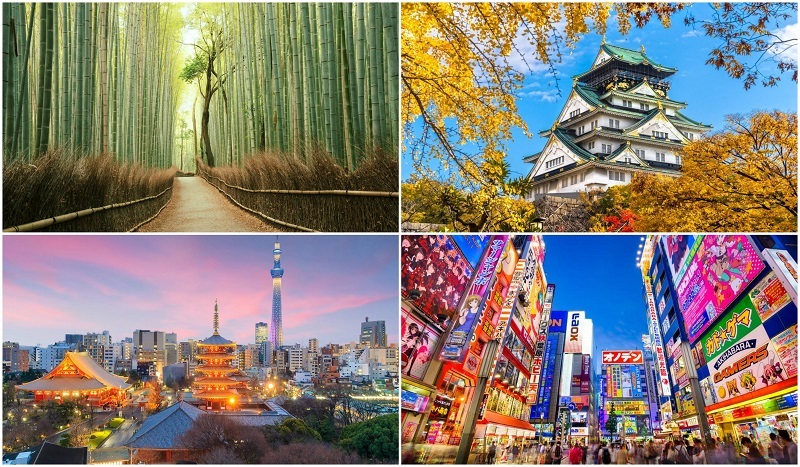 Are you planning a 2 week holiday to Japan and have no idea how to organize your itinerary? With its rich history and culture, hi-tech innovations, its attention to detail and clockwork efficiency, there’s definitely a lot to see. 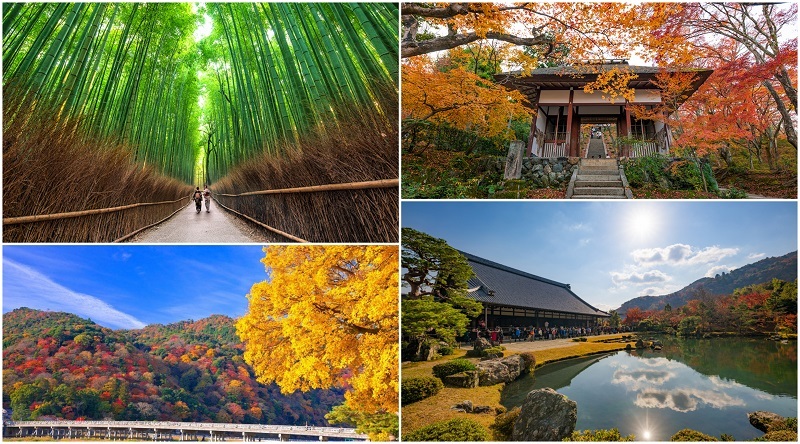 In this 2 week itinerary, we’ll recommend the best places to visit in Japan and guide you through the major cities Kyoto, Osaka and Tokyo. 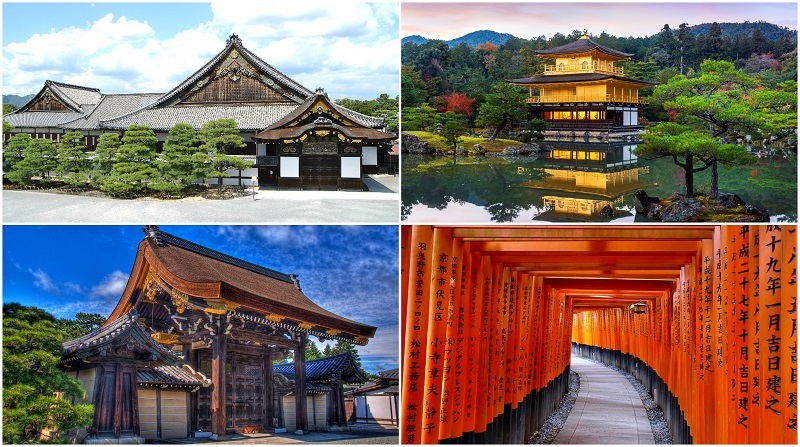 We’ve designed a flexible 2 week Japan itinerary since the starting point may vary for all travellers. You may start in Kyoto, Osaka or Tokyo, so we’ve organised some time on the last day for you to make way to your next destination or airport. Departure Time – 8 am. Don’t be fooled by the stark exterior of Nijo castle, in contrast the interior is extremely ornate. Built in 1603, there is plenty of history to learn from your guide as you stroll through Nimourau palace with its 5 gold leaf connecting buildings. The gardens are beautiful too, and you will also see the kitchens and guard house. Kinkaku-ji Temple also known as the golden pavilion, is Kyotos most popular temple with good reason. It’s gardens are considered the most authentic and exquisite Japanese gardens worldwide. Next your tour takes you to Koyoto Imperial palace, with its simple and calm Japanese atmosphere. Enthronement ceremonies took place in the Shishinden Imperial state chamber. The Royal family left in 1868 when Tokyo became capital of japan, but a tour here will teach you plenty about the history of Japanese Royalty. Fushimiinari Taisha Shrine, noted for it’s bright colours, is the next attraction. You will then visit Sanju-Sangendo Hall Buddhist Temple, which has 1000 life size statues flanking the great hall. The tour concludes from the heights of Kiyomizu Temple where you can enjoy beautiful panoramic views of Kyoto. Departure Time – 8:45 am. 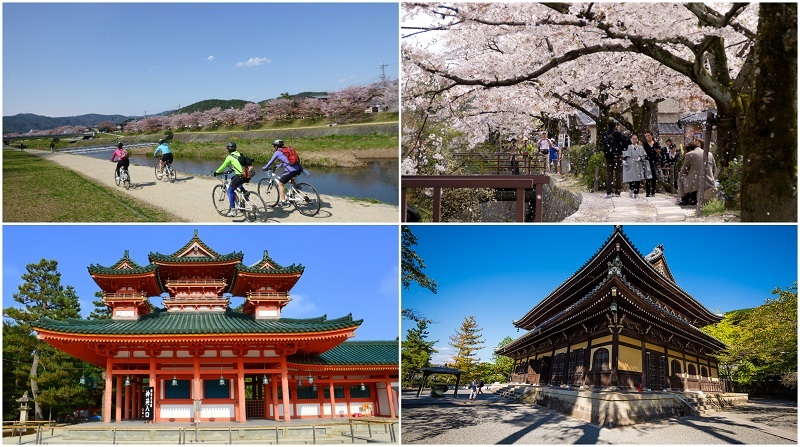 Exploring Kyoto by bike is a brilliant way to see the city up close and personal. You will gain a real sense of the culture and atmosphere of one of Japan’s most famous cities. Your route follows the Kamo River past many traditional restaurants along the waterfront. Cycle along quaint canals to see a classic example of zen Buddhism, the Nanzenji Temple. Finally you will ride down the stunning path of Philosophy, flanked by hundreds of Cherry trees. This is a sight that should be on your must do list if you visit during Cherry blossom season in April. You will be expected to cycle 9 miles (15 km) on this tour. Departure Time – 1 pm or 1:30 pm. One thing (amongst many) that the Japanese know how to do well and appreciate fully, is enjoy a cup of tea. Matcha tea is now found worldwide as it is so popular, and it is this tea you will drink. Choose from a 1 hour traditional tea ceremony in a machiya, wooden building. If you prefer, choose a kimono wearing option, where you can also dress in Japanese costume so you both look and act the part. Learn to pour tea, the proper way to sit, and enjoy a most peaceful, authentic cup of tea. Departure Time – 5 pm or 5:30 pm. Entertainment in Japanese culture is very different to our own western Culture. An evening spent watching various Japanese entertainments is therefore an excellent way to learn more about this remarkable culture. Watch maiko dancers, gagaku court music, puppet theatre, the art of flower arranging and more. Don’t worry about language difficulties either, as you will have an informative guide to explain each performance. 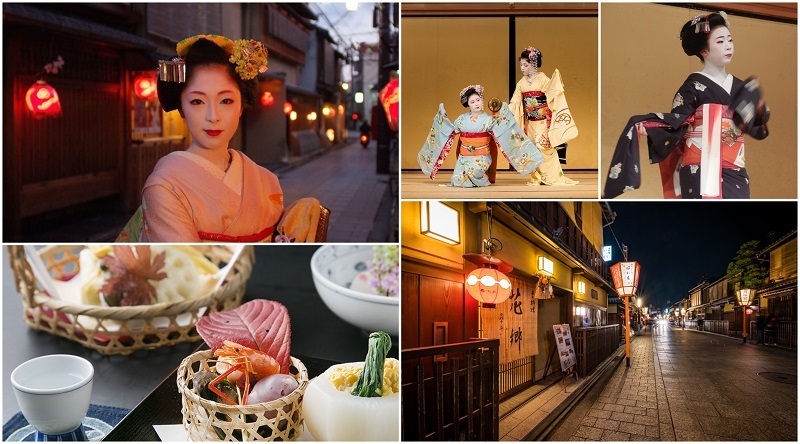 After the show your guide will take you through Gion district with its traditional houses. At Gion Yoshi-ima you will dine by candlelight on a traditional vegetarian dinner which includes tofu, eggplant, renkon and shitake mushrooms. The night draws to a close with a tea ceremony, leaving you with amazing memories of a fantastic Japanese cultural evening. Departure Time – 8:40 am. Escape from the city and enjoy some serenity as you stroll beneath sagano bamboo groves at Arashiyma. Relax in the natural countryside and meander your way to various temples in this stunning setting. Tenryu-ji is ancient, dating from the 14th century. Jojakko-ji Temple is thought to have been a nunnery. It also has an impressive pagoda hidden amongst Japanese Maple trees. Togetsukyō Bridge, also known as crossing moon bridge, has extensive views of the Huzo river and surrounding forested hills. From here, you’ll have time in the afternoon to catch a bullet train to your next destination – Osaka or Tokyo. If this is the last part of your 2 week Japan itinerary, you’ll have time to go to Osaka Airport for an afternoon or evening flight home. Departure Time – Gates open at 9 am. A fantastic chance to see a slice of Hollywood at one of only 2 places in Asia. 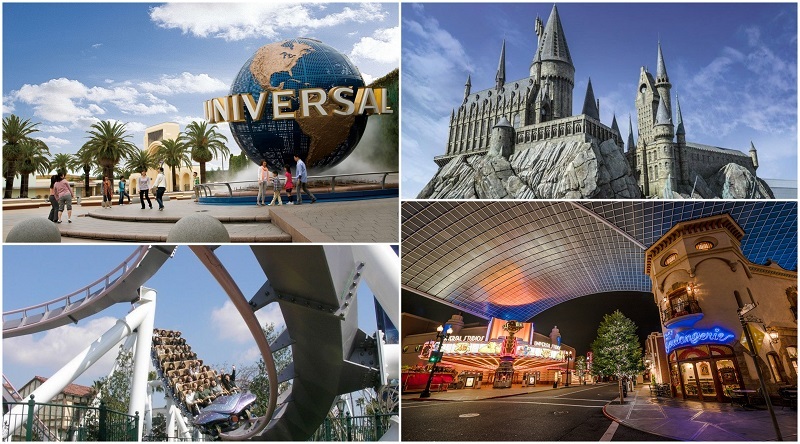 At Universal Studios in Japan you will see attractions from the Despicable Me, Spiderman, Jurassic Park, Jaws, Terminator, and Hogwarts. There are several themed districts to explore, including New York, Hollywood, Snoopy Studio and Jurassic Park. The family friendly fun continues with various movie mascots walking around. The ever popular brand, Hello Kitty, Snoopy, and Seaseme Street Characters are just some of the characters you could see. Departure Time – between 12 pm – 12-30 pm. The ancient city of Nara is a UNESCO World heritage sight due to the many historic monuments there. 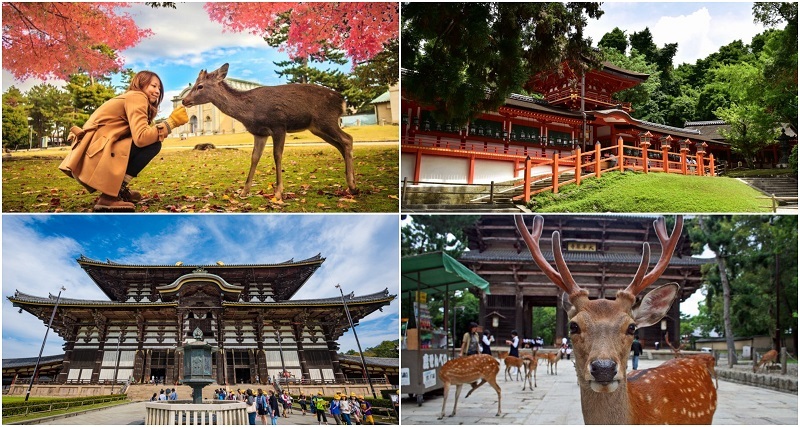 Dating from the 8th century, the cultural wonders include the Todaiji Temple, Kasuga Shrine and deer park. Your knowledgeable guide will show and teach you about the gigantic bronze Buddha at the Todaiji Temple. They will enlighten you about the Kasuga Shrine’s impact on Japanese culture as you stroll along the pathways amongst 3000 lanterns. It’s a glimpse at ancient Japanese history and a fantastic place to explore. Departure Time – 9:50 am. The best way to see Osaka and it’s highlights is on foot. Your first stop in this beautiful city is the stunning floating garden observatory. Enjoy panoramic views of Awaji Island, Mount Ikoma and the city from the open air sky bridge. A tasty Japanese lunch follows, before you continue to the magnificent Osaka castle. The Castle is definitely one of the highlights of the city with many relics held inside the building. It was built in 1583 as the intended capital, with impressive giant stones. 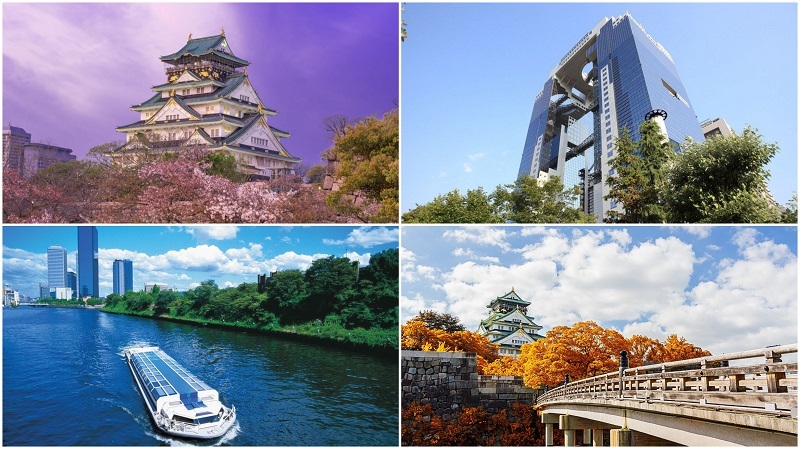 Finally you will enjoy a 1 hour riverboat tour around Nakanoshima, for fantastic views of Osaka castle and the city’s scenery. Departure Time – 6 am. 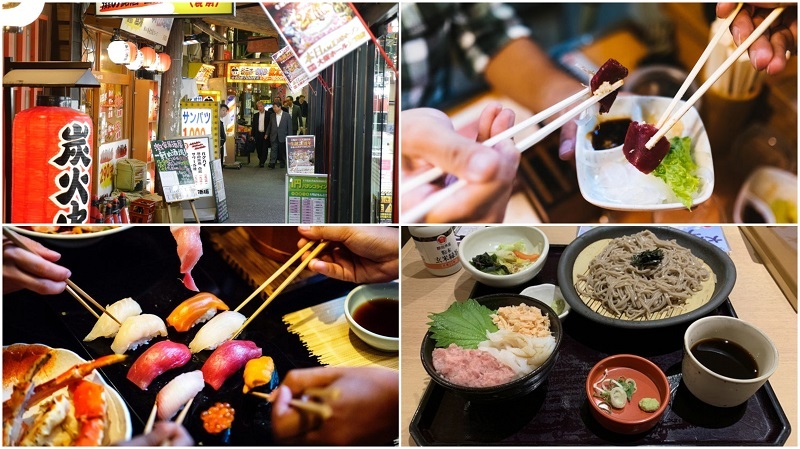 Get to know the real Osaka on a small group (6 people max) food tour. You will venture into 2 of Osaka’s best food areas, Tenma and Kyobashi. There you will try traditional Osaka dishes, accompanied by a native English speaking guide. The guides are fluent in Japanese to ensure you get the most out of your tour. Exploring on foot means you will get to enjoy various other attractions along the way, such as pretty views from Ogimachi Park. Typical dishes you will try at the restaurants visited include “kushi katsu” (fried food on sticks), “dote nikomi” (slow cooked beef parts), and “tonpei yaki” (a grilled pork and egg dish). Opening Hours – 10 am – 8 pm. 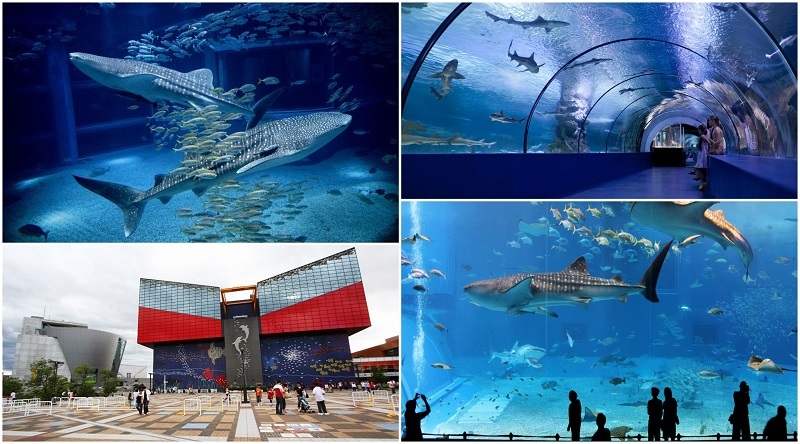 Osaka Aquarium Kaiyukan is home to hundreds of marine animals and is sure to delight the whole family. Highlights include the worlds largest domed tank in the Arctic Zone and rhythmic Rockhopper Penguins in the Falkland Zone. In the Maldives Zone you can touch sharks and stingrays if you choose. As an island nation Japan’s culture and cuisine are entwined with the sea, so you can be certain that a visit to the Aquarium will be filled with wonder. Opening Hours – 24 hours. After all that busy sightseeing you definitely deserve a visit to Osaka’s best spa. Just the thought of soaking in hot pools and spa treatments on offer will make you relax. With 16 different hot spring baths and an indoor swimming pool, you can easily spend all day enjoying warm waters. Outdoor baths, herbal baths and stone saunas are just some of the experiences you can choose from. After Osaka Aquarium and Spa World, you can make your way to Kyoto or Tokyo via bullet train. If this the last part of your trip, make your way to Osaka Airport. Opening Hours – 8 am – 10 pm. 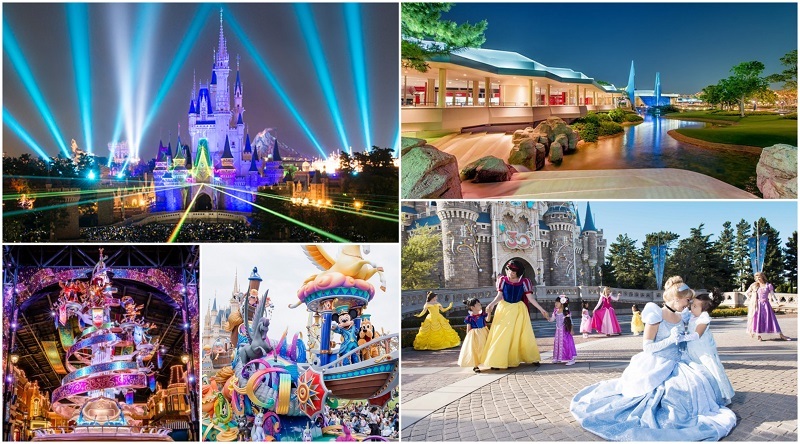 Step into a world of fantasy at Disneyland Tokyo. Attractions from all your favorite Disney Movies can be found here, including Pirates of the Caribbean, Toy Story, Snow White, Cinderella and Pinocchio. There are plenty of parades where you can see your favorite characters, including night time parades with fantastic firework displays. Meet famous Disney characters including Mickey and Minnie Mouse. Disney world really is another world, and it is one for the child in everyone! 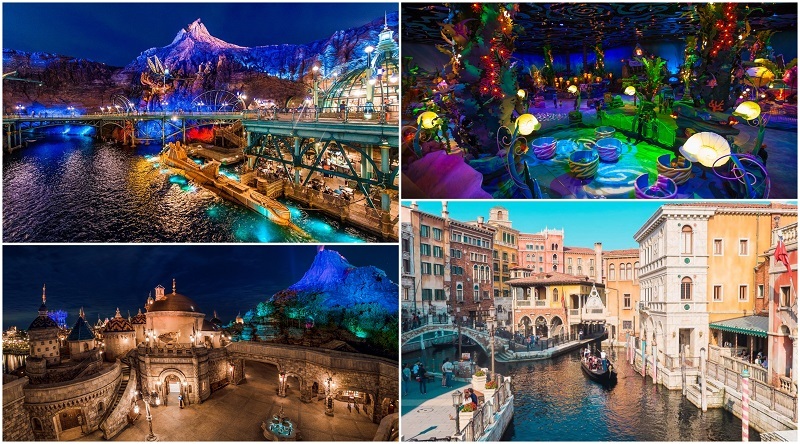 Tokyo Disneysea has similar delights to Disney world, as you would expect, but with plenty of water incorporated. Attractions include a Mermaid lagoon theater, Venetian gondola rides and Sinbad’s Storybook. Likewise, there are plenty of parades including Fantasmic and Lightning Mcqueen victory lap for a limited time only. Donald Duck, Goofy, and of course, Ariel are characters you can meet. It would be almost sacrilegious to visit Japan without enjoying their famous sushi. This tour is great for both those who love sushi, and those who are curious to learn about it and try some. 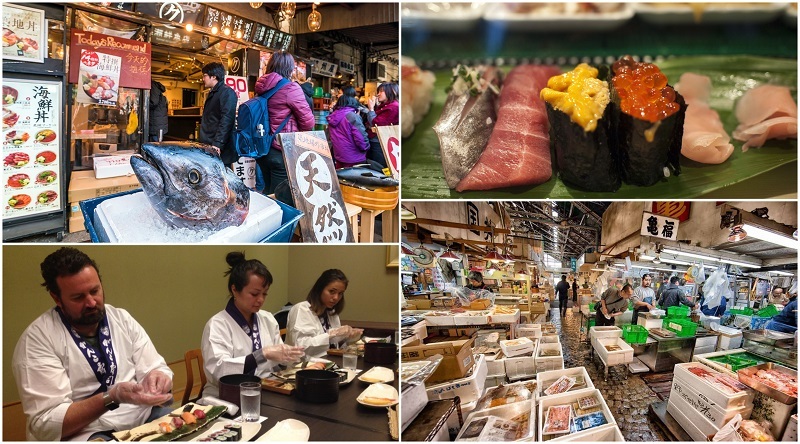 Firstly you will visit the worlds largest fish market, Tsukiji Fish Market. The inner part is restricted and is for wholesale only, whereas the outer stalls are for everyone. Peruse them with a local guide and learn plenty about Japanese fish and sushi. Continue to a popular Sushi Restaurant where a master chef will instruct you in making your own sushi rolls and nigiri. Your guide will be on hand to translate for you, making the task easy. The tour culminates after you dine on your handmade sushi for lunch. Show time – option to select 5:55 pm, 7:50 pm or 9:45 pm. 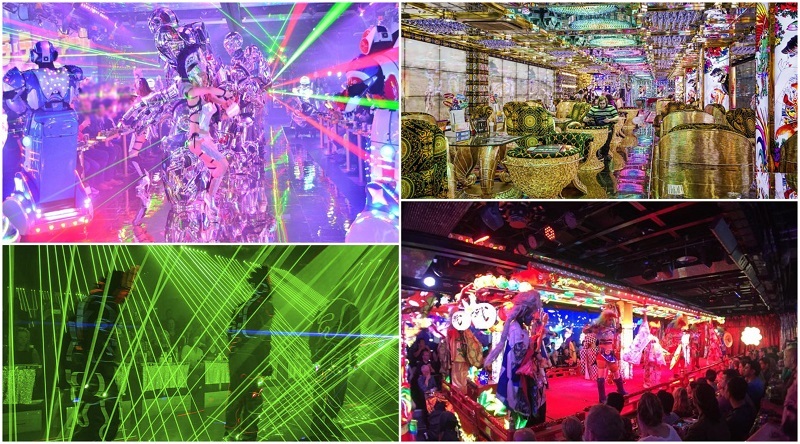 For an evening of techno extravaganza and a taste of one of the more bizarre aspects of japan, head to the robot cabaret. The novelty is bound to leave a lasting impression on you. The performance includes dancing girls in colorful outfits, dinosaurs, pandas, ninjas, and plenty of robots on stage! Be prepared for flashing lights, techno music, and taiko drums for an evening to remember. Departure Time – between 7:30 am & 9 am. 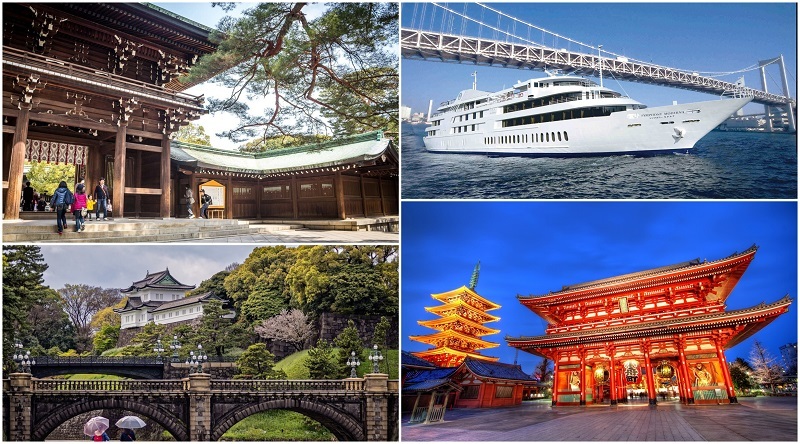 Combine 3 of Tokyo’s most popular attractions in one tour. Begin at Meiji Shrine and learn why it’s Tokyo’s most important Shinto shrine from your guide as you wander its buildings and gardens. Your next stop is the extensive Imperial palace east garden. There is plenty to explore here, including a tea pavilion and traditional Japanese garden. Head to Asakusa Kannon Temple also called Senso-ji. It’s Tokyo’s oldest and most significant Buddhist Temple. Learn more from your guide as you explore the Temple. After a western lunch overlooking Hamarikyu Garden hop on board for a 1 hr sightseeing cruise in Tokyo bay. Opening Hours – opened til 10 pm daily. At 350m tall Tokyo Skytree looms over the city and is unmistakable from afar. 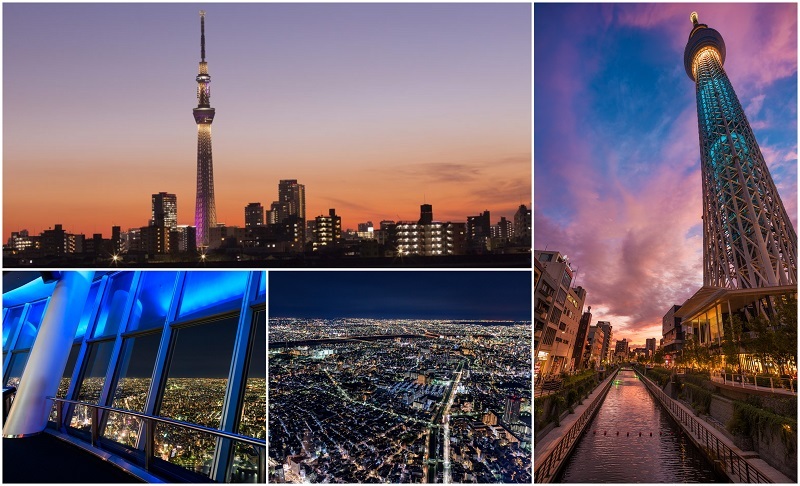 It also offers the best place for panoramic views of Tokyo and Japan. On a clear day it is possible to see up to 100km away. You might even get a glimpse of Mount Fuji! An evening visit will be especially atmospheric, with romantic sunset views and the glittering city lights. Departure Time – between 7:35 am – 8:50 am. 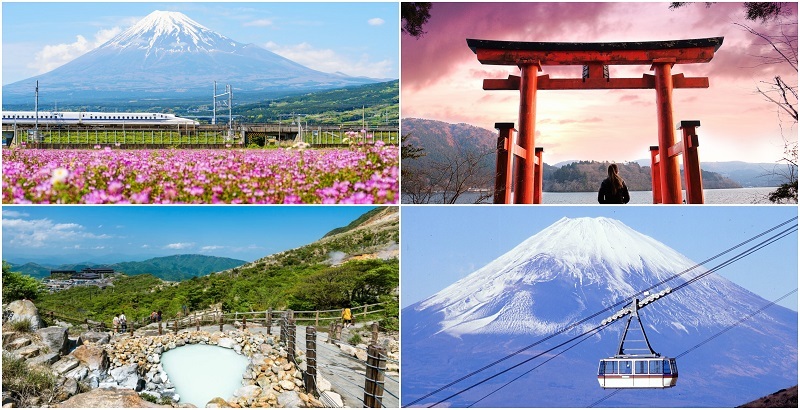 Escape the hustle and busy of Tokyo on a fabulous day trip to Mount Fuji and lake Ashi. Experience the Japanese efficiency of the bullet train. At mount Fuji visitor center learn about the interesting history and geology of Japan’s famous mountain. 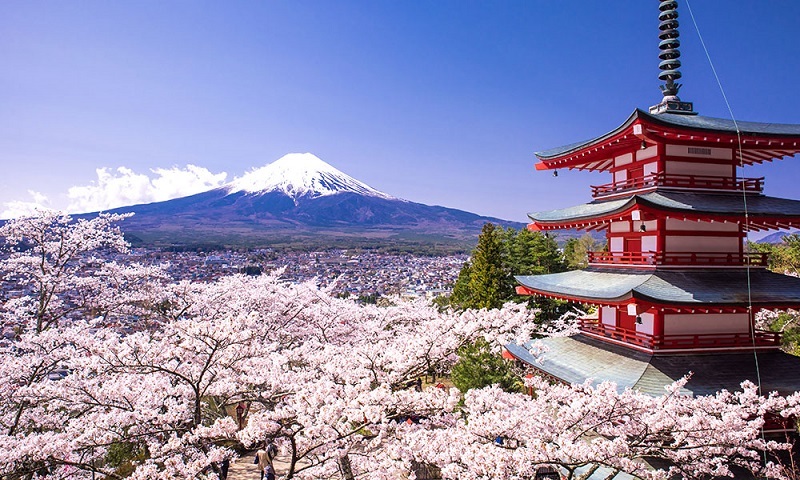 Enjoy brilliant views of Mount Fuji from the observation deck and at 5th Station take in the shrines, shops, and torii gates. After a delicious Japanese lunch continue to Lake Ashi. Admire beautiful views during a lake cruise before embarking on Mt Komagatake Ropeway. This tramway goes to the top of Mount Komagatake where you will enjoy stunning views of lake Ashi and Mount Fuji in a breathtaking backdrop. 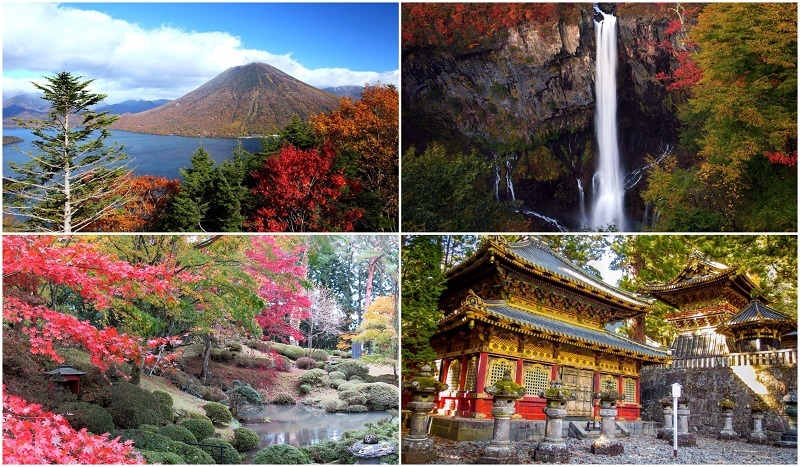 Nikko national Park is famed for its picturesque scenery and natural beauty. It’s no wonder that it has attracted Buddhist and Shinto worship for centuries. There are many amazing sights at Nikko, including the Toshogu Shrine, a UNESCO world heritage site. It is one of the national treasures of japan. Amongst its wonders is the infamous monkey carvings of ‘see no evil, hear no evil, speak no evil’ proverb. The Kegon Waterfall is one of the best 3 in Nikko, with a fall of 80 meters. The purpose built observation deck is great for capturing the perfect photo. Finally you will visit Shinjuku station, west exit, where the tour ends. This is one of Tokyo’s best shopping and entertainment areas. It’s perfect for your evening meal, some late night shopping, and Japanese entertainment. Departure Time – 10 am. If you know anything of anime you will know of Studio Ghibli. Even the uninitiated have probably heard or seen popular studio Ghibli movies, such as the Oscar nominated ‘Spirited Away’. Encompassing all the anime glitz and glam of Japan, a visit to Studio Ghibli Museum is a must for movie lovers and anime fans. 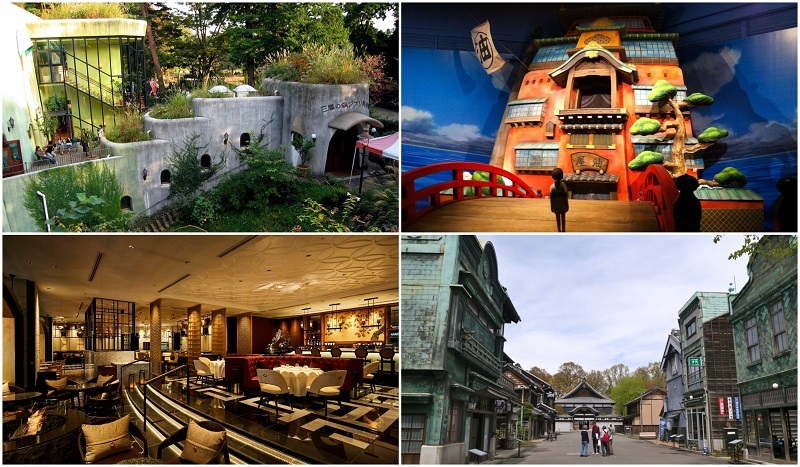 Enjoy lunch at Hotel Gajoen Tokyo, whose architecture inspired Studio Ghibli, while a guide teaches you about it’s history. Then you can explore the museum at your own pace, discovering the animation process. It’s great for all the family, thanks to the fun studio Ghibli characters featured throughout the museum. You’ll have time to travel to Kyoto, Osaka or the nearest Tokyo airport at night. However, if you’re not in a rush, it might be best to rest for the night. Quite possibly the most convenient way to travel around the Japan would be to use the JR pass. This pass is made and distributed by the Japan Railway Group (JR), a collection of companies that offer transportation services. This pass will allow you to have unlimited access to the trains and shinkansen that connect the different cities of Japan including Kyoto, Osaka and Tokyo. It will even allow usage of certain buses and subway lines. For this trip, the 14 day JR pass will save you the most money and time at each station. If you can’t speak much Japanese, this will be ideal as you won’t have to lineup and explain the passes you want every time you want to go somewhere! Appropriate clothes. Japan is surprisingly chilly, windy and rainy in autumn and winter. In summer, it is ridiculously hot and humid. Shoes that you can take on and off easily. Basically whenever you enter a temple, castle, palace, hostel or someone’s home, you will take off your shoes. And God save you if you have to tie and untie your shoelaces every time. Want to climb Mount Fuji? Bring your hiking gear. Also take note that you’ll need 2 days to make the full climb. You can finish it in just one day but there’s a reason that achievement is sometimes referred to as “superhuman”. Gifts! If you make a friend in Japan, they’ll be very grateful. Adapters for Type A outlets. Google Maps is your friend. Google Translate is your savior. The average Japanese person is not proficient at speaking in English. But given that they’re also on average very polite and thoughtful, they will patiently wait for your fumbling attempts to mangle the Japanese language via Google Translate and do their best to help you out. 7-11s, Lawsons and Family Marts are amazing if you want food on the go, buy or reserve tickets for buses or sights (it’s all in Japanese) or you just want to go to the bathroom. It’s totally fine to just go in and use the bathroom and leave.